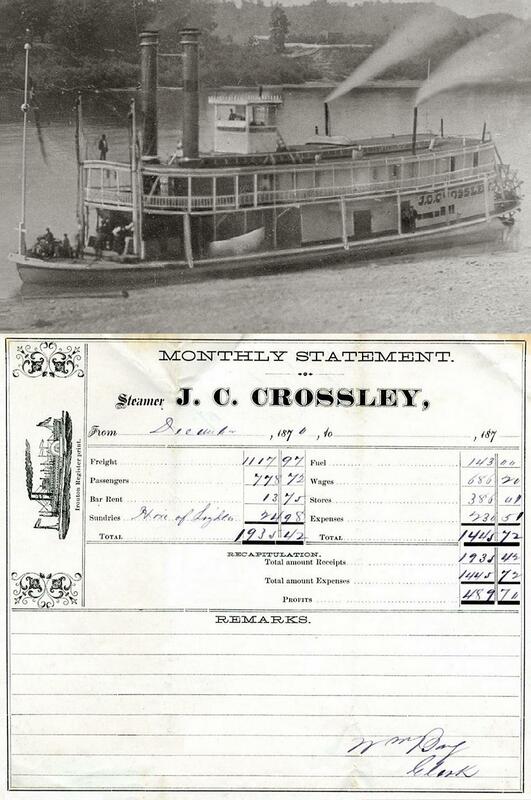 J.C. Crossley - "Hire of Lighter" under sundries probably means they rented a barge for some purpose. Lighter was an archaic word for a flat bottomed barge. Envelope from the M.V.B.L. 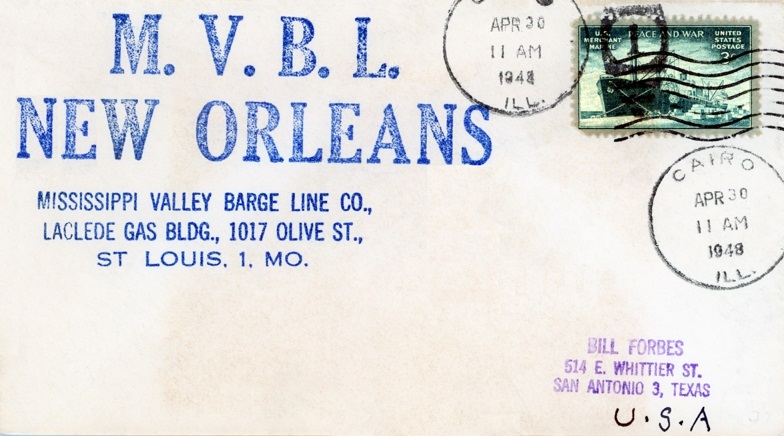 (Mississippi Valley Barge Line Co.) NEW ORLEANS St. Louis 1, Missouri Canceled 20 April 1948 Cairo, Illinois Addressed to Bill Forbes San Antonio, Texas There is nothing in the envelope now but it may have have contained a pay check. Reference to the M.V.B.L. can be found in the 1st sentence of the article on John Hartford below. John Hartford bought his first Gibson banjo with money he made working on the Mississippi Valley Barge Line when he was 15 years old. He started playing the fiddle about the same time. Since then, Hartford has turned his obsessions with the river, the banjo and the fiddle into an inimitable style that has made Hartford the Mark Twang of American music. On Saturday, Hartford brings his instruments, the amplified board he dances on and his bizarre sense of humor to the Amaturo Theater at the Broward Center for the Performing Arts. "My job description is that I've spent the last 40 years attempting to play the world's two most despised instruments in one of the world's two most commercially unacceptable forms of music," Hartford said in his deep baritone voice during a phone interview. "One is bluegrass music and the other is polka." But Hartford, 54, has had plenty of commercial success. He has won three Grammy Awards, two of them for a song that has gotten more radio airplay than just about any other record in country music, Gentle on My Mind. Glen Campbell's recording of Hartford's tune has been played nearly 5 million times since it was released in 1967, according to Broadcast Music Inc., in Nashville, which tracks radio airplay of songs. Only three other records tracked by BMI have been played more: Yesterday by the Beatles, Never My Love by the Association and Campbell's recording of By the Time I Get to Phoenix. After Gentle on My Mind and a regular stint as sideman on Campbell's popular TV show, Hartford lit out for the territory like Huckleberry Finn. He became one of the first bluegrass hippies, scattering dope references, jibes at the establishment and zany songs such as Boogie on his albums, mostly recorded for independent labels. On Mark Twang, the album that won him a third Grammy in 1977, Hartford spoofed the father of bluegrass, Bill Monroe, by recording Monroe's Little Cabin Home on the Hill a cappella. Hartford sounded as if he were singing underwater. 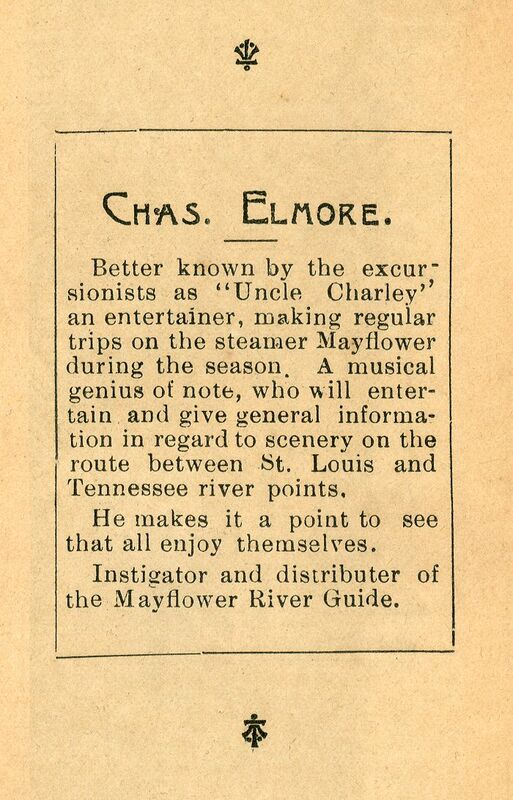 Uncle Charley Elmore was apparently an early "Riverlorian" . . . doesn't say what instruments he played but he also served as narrator to passengers about the "passing scene" viewed from the Mayflower. Charley dreamed up the guide and distributed it, imagine the packet co. foot the bill for printing. 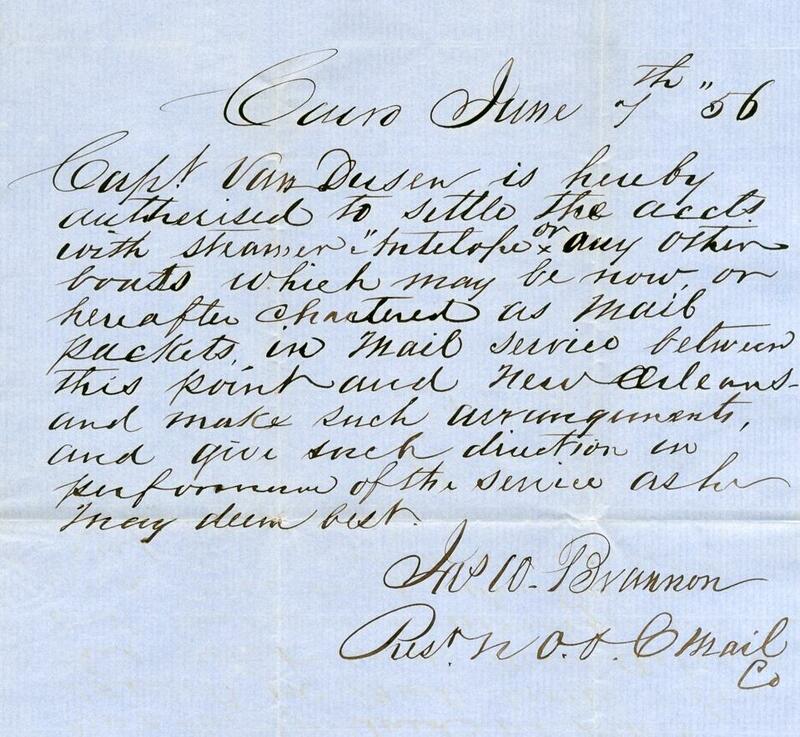 Here's a genuine artifact from my early collecting days written on June 7th, 1856 at Cairo, Illinois by James W. Brannon, President of the New Orleans & Cairo Mail Company giving authority to Captain Van Dusen to settle the accounts of the steamboat Antelope and any other boats chartered as mail packets operating between Cairo and New Orleans at his discretion. Cap't Van Dusen is hereby autherized (sic) to settle the accts with steamer Antelope or any other boats which may be now or hereafter chartered as mail packets in mail service between this point and New Orleans - and make such arrangements, and give such direction in performance of the service as he may deem best. Built at New Albany, Ind., 1853. 587 tons. Ran Louisville-New Orleans, Capt. E. Brown, master. Snagged and lost at New Orleans, Louisiana on Sept. 27, 1864. Her engines were from the ALEX MITCHELL. She ran St. Louis-St. Paul under the Diamond Jo banner for many years. In December 1886 she was chartered to Anchor Line and ran St. Louis-Vicksburg. She was rebuilt in 1892-94 by Diamond Jo and was on the ways at the Eagle yard in Dubuque for over a year. In 1903 she was rebuilt at Dubuque. On August 27, 1909 she collided with a moored barge while she was making a landing at Fountain City, Wisconsin. A hole was created in the hull about 2 feet above the water line. From 1911-1917 she continued in the St. Paul trade under Streckfus Line ownership. In 1917 she was rebuilt into an excursion boat for St. Louis. Rebuilt and renamed SENATOR at Paducah, Kentucky 1939-40. 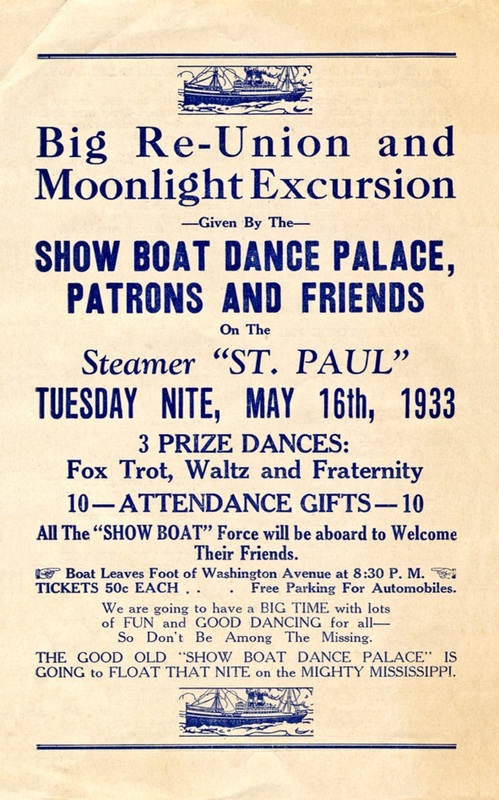 1.80 x 3.70 inch ticket for a Special Trip aboard "the beautiful SAINT PAUL" for United Dance Clubs opening Excursion and Moonlight Dance that left the foot of Washington Avenue at 8:30 p.m. "rain or shine" on May 9th which fell on a Monday in 1938 so this cruise may have been initiated at Pittsburgh the last year the ST. PAUL was operating there before she went to Paducah in 1939 where her name was changed to the SENATOR. Note: A 1954 Pittsburgh Legal Journal includes the following: "Washington Avenue was a thoroughfare, which we believe corresponded with the road now extending from the Liberty Tubes through Dormont and Mt. Lebanon and thence on to Washington, Pennsylvania." 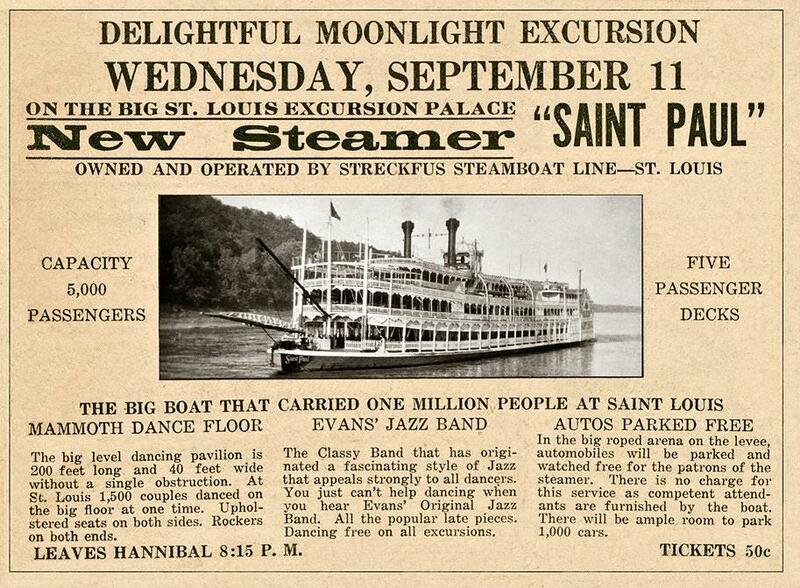 1933 flyer for an excursion aboard the ST. PAUL leaving from "the foot of Washington Avenue" (which flowed onto the Eads Bridge) across the Mississippi at St. Louis. The sponsor of the excursion was the"Show Boat Dance Palace" located on Iowa Avenue in St. Louis, was one of at least half a dozen "dance halls" in St. Louis during the 30's. 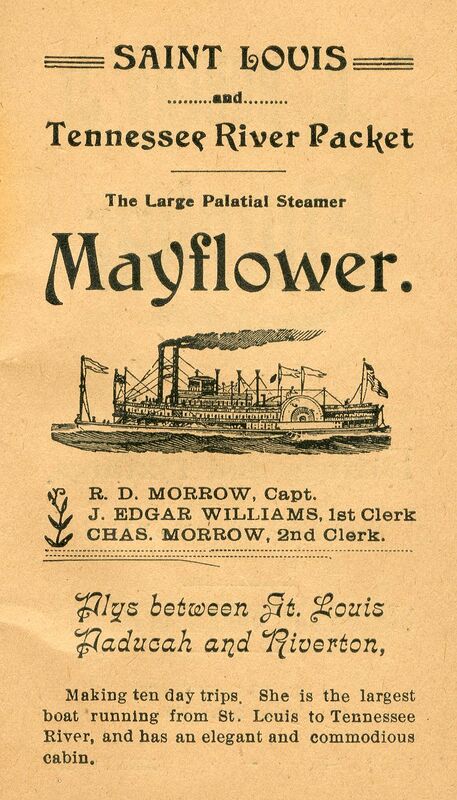 On the top and bottom of this handbill the "job" printer used vignettes of an ocean-going ship rather than a steam riverboat which would have been more appropriate. The ST. PAUL was built in 1883 at St. Louis, MO for the St.Louis & St. Paul Packet Co. and ran under the Diamond Jo flag. Also briefly chartered to the Anchor Line. Rebuilt in 1892 at the Eagle Yard in Dubuque, Iowa by Diamond Jo - then rebuilt again at Dubuque in 1903. She went to the Streckfus Line in 1911. In 1917, Streckfus rebuilt her into an excursion boat running in the St. Louis area. Rebuilt again at Paducah, KY in 1939 as the SENATOR. Retired from excursion service in 1942. Abandoned near St. Louis in 1953. Another vintage broadside from my earliest days of collecting this material during the 1980's. at Kittaning, Pennsylvania on the Allegheny River around 40 miles northeast of Pittsburgh. Captain Dan Fry was a little fellow who, if he were found under a Christmas tree, would pass for Santa Claus dressed up in store clothes. Same twinkly eyes, ruddy cheeks, perky nose, beard and all. He showed up every year at the annual meeting of the Allegheny River Boatmen's Association and was the center of the scene. He always was called upon to make a speech. Captain Fry would slowly get to his feet and take a good, long lingering look all around the hall until silence reigned supreme. 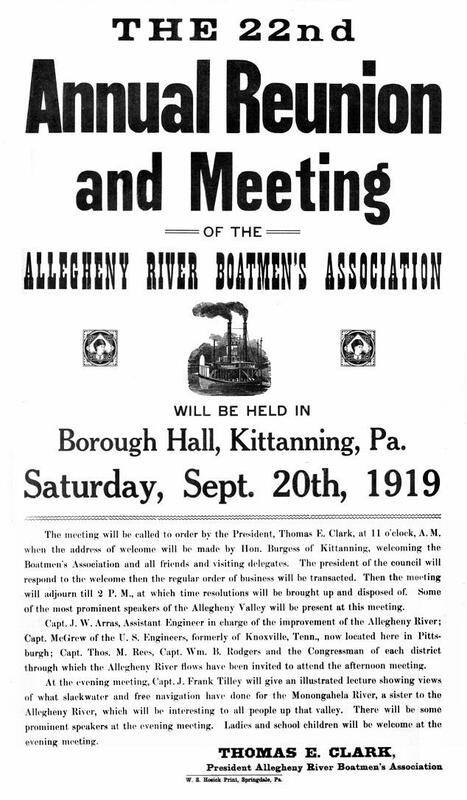 Then, in a quiet, almost unbearable voice, he would say, "Mr. Chairman of the meeting and my friends of the Allegheny River, the most noble stream in the world." Another pause. Captain Fry's merry eyes roved around until he discovered a particular face in the audience which suited him. Thereafter all remarks were directed to that individual. "I am not much of a speechmaker, but . . ." he said. His story usually picked up a thread of the long and adventurous life he had spent keelboating and steamboating on his beloved river. The homely little reunions of this Boatmen's Association started back in 1897 and met annually, without interruption, until 1919. Each one had a new tinge of sadness, inasmuch as the members were growing old, and tragedy stalked in all eyes when a new arrival announced, "No, Jim can't get here today: he's down with rheumatism bad and can't make it." To men who have lived a river life an inability to gather among old friends and rehearse the glories of a past yesteryear is worse than the inevitable visit of the Grim Reaper in person. "Jim can't get down today." Real trouble, there. Heads would shake, canes would pound the sidewalk in mute appeal, and tears would come. "Jim can't get down, did you hear?" A whole year has rolled around since any one of those veterans has seen Jim. No word, no sign. Christmas has come and gone without the exchange of a postcard greeting. Yet Jim belongs at the meeting of the Boatmen's Association. Jim is one of the fellows. Rivermen, as a group, are an odd lot in this respect: those bitter tears were springing from a knowledge of how Jim felt about it—laid up at home with that persecuting, damnable, inhuman failing of old age: rheumatism. Each old-timer could see Jim sitting at a window looking out on the valley and aching his heart out to be at "the meeting." Engines 20's - 8 ft. stroke. Owned by the Huntington & St. Louis Towboat Co. of which Fred Hartweg was president and treasurer, Gottlieb Hartweg, secretary, with offices maintained at the foot of Race Street, Cincinnati. When this undated 3 X 5 inch advertising card was printed the office was located at the foot of Vine Street. 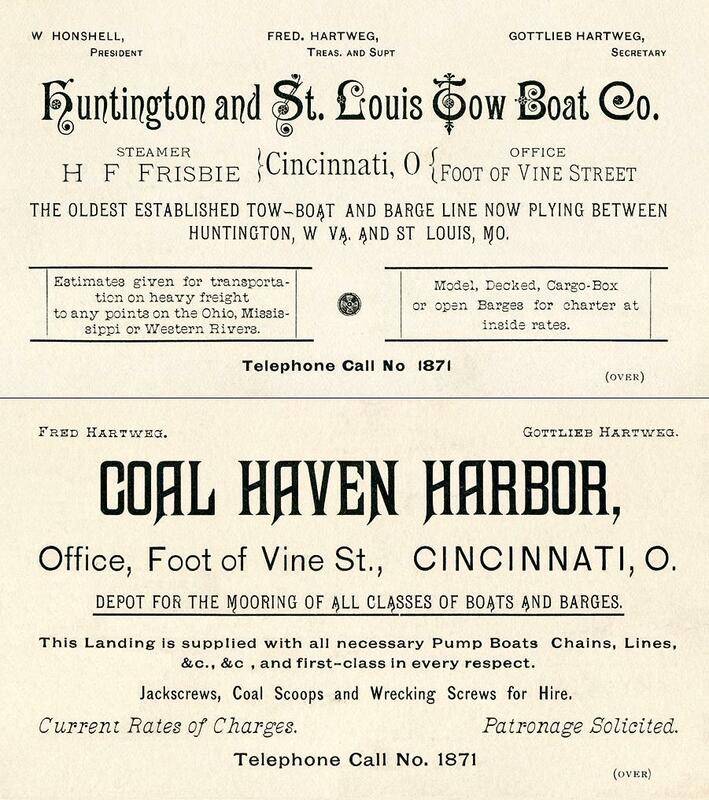 On the reverse of the card is the company's promotion of their other enterprise - Coal Haven Harbor for the mooring of "all classes of boats and barges." The H & St. Lou Towboat Company also operated the towboat WASH HONSHELL. Her skipper in 1888 was Capt. William Rutter of Clarington, Ohio and on one trip, just leaving Cincinnati with a big tow of coal, produce, etc., the tow struck the Kentucky pier of the Southern bridge, sinking two barges. Capt. Rutter fell dead of heart failure as a result of the excitement. Capt. Rutter was then about 65 years old, a tragedy all the worse because his wife and two children were aboard making the trip south. The FRISBIE made frequent trips to the upper Mississippi, towing cross ties to Burlington, Iowa. Capt. Henry Nye and Capt. Henry C Pownall were masters on her. "Buck" Nye was chief engineer for some time and Ernest P Cropper was 2nd, Noah and Sam Ellis were on her later. The Combine bought her and towed her to Pittsburgh with the BOAZ in September, 1903, then dismantled her at Elizabeth, Pennsylvania. Her machinery went to the SARAH EDENBORN. H. F FRISBIE, for whom she was named, died in January, 1912. Above 1890's letterhead for the Merchants' & Planters' Packet Co. of Greenwood, Mississippi restored from the upper portion of a dilapidated 5.90 x 9.50 inch original. "W.F. Ramay built the sternwheel steamer FERD R. at Greenwood in 1892 and entered the trade. The next year the new boat hit a snag and was towed to Captain Pugh's boatyard at Yazoo City. She was originally only 70 feet long, but when rebuilt she measured 93.8 x 16.2 x 3 feet. When the FRED R. returned to the Yazoo trade, she was owned by W.C. George, who had started the Greenwood Transportation Company. Within a few month, the Greenwood firm purchased the sixty three ton sternwheeler E.A. PHARR to serve upper river shippers." Attached is a scan of the 3rd and last letter dated November 17th from Capt. Overstreet to the Anchor Supply Co. of Evansville, Indiana (on the Ohio River) asking why his order by a 2nd letter had not been filled yet. His 1st letter dated November 7th to Anchor Supply listed what he wanted with a request to let him know how much they would cost and that he would want them to be delivered to him on the Green River. Overstreet's first letter was returned to him with prices written on it pencil by Anchor Supply. In his second letter he confirmed his order. The Captain mentions that the correspondence was transported to Evansville by the cotton packet GAYOSO. We don't know if the Irish potatoes, turnips and cabbages were finally delivered to the DIXON or not. Above the letter from November 17th I have included a photo of the DIXON and below the letter a photo of the GAYOSO. Both photos are from the La Crosse collection. U.S. Snagboat "Wm Preston Dixon." Master, U.S. Snagboat Wm. Preston Dixon. Built by James W. and M.A. Sweeney in 1890 at Jeffersonville, Indiana. Operated by the U.S. Corps of Engineers on the Green River in Kentucky. In 1908 she was replaced by the Snagboat/Towboat MAMMOTH CAVE. Cotton packet; ran Memphis-St. Francis River, owned by the Lee Line, Memphis. Sold to Captain Elmore Bewley in January 1895 for the Evansville-Green River trade. Anchor Supply Co. at 121-25 NW Riverside Dr., on the corner of Vine St.